So you need to get rid of the unsightly double chin and tighten the skin, you need the Safe & effective method for facial shaping. Alma V Shape is not only the safest, but also the most effective non-invasive option for face contouring. V Shape has been performed in 80 Countries and successfully treated thousands of patients. Quick Visible Results– You may see results immediately after the first treatment, though most improvement will be noticed in the days and weeks following each treatment session. Number of Treatment Sessions Required– a set of 4-6 treatment sessions are recommended for the Alma double chin tightening treatment. No Side Effects– Alma V Shape is safe and effective with no side effects or downtime. Duration of Each Treatment Session– A typical session of Alma double chin tightening lasts 20-30 minutes. As the procedure is pain-free, you won’t need to spend any time preparing or recovering from the treatment. Most Body Parts can be Treated– While V Shape is a procedure designed for your chin, cheeks, neck and the periorbital area around your eyes, the treatment can be done on any area of the body that needs tightening. 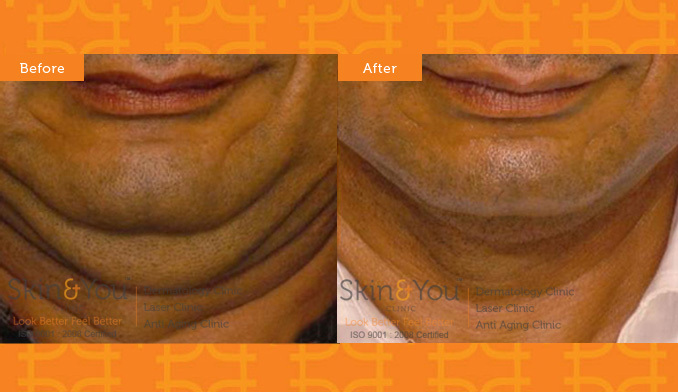 Why Skin & You Clinic for Double Chin Skin Tightening Treatment? As the name suggest the Alma v shape double chin tightening is to lift the face and give the youthful look. The treatment can reduce the double chin and tighten loose skin at the same time. We at skin and you are one of the few clinics to have used the system successfully with good results.